Boca Raton, FL - From the beginning, Katherine Clancy “KC” Thompson faced overwhelming odds. KC made her debut seven weeks premature and weighed just four pounds. She had some learning challenges and was held back a year, in second grade. At eight years old, with her mom and two younger sisters, they enrolled for martial arts training at Florida Karate Academy in west Boca Raton. “I hated going to karate. It seemed so easy for my sisters and mom, while I struggled." They all dropped out, after awhile. “I attended a special school, and never really felt accepted. I didn’t have close friends.” At age 16, KC returned to Florida Karate Academy. It was a different experience, this time. “KC pushes herself to succeed and is an inspiration to the younger students at the dojo”, stated Sensei Bob Siebelts, a fourth degree black belt. KC credits her academic success to the skills she sharpened in martial arts: discipline, focus, and keeping the goal in mind, at all times. A recent graduate of American Heritage School, she was one of the 18 recipients of Palm Beach County Pathfinder Awards, from a field of 615 nominees. This spunky nineteen year old earned her black belt last October in Seibukan (authentic Okinawan) karate. “I had visions of becoming a champion, for the first time in my life”, she added. This past July, she competed at Nationals and earned a spot on Team USA. Erin Ravindran is in eighth grade at Saint Jude Catholic School. She has practiced martial arts for over six years, with her younger sister. “Other kids play soccer or basketball. I love saying I do karate; it makes me unique. I know I can protect myself and stand up for what it´s right”, she stated. “On Erin’s first day (and every day after), at Florida Karate Academy, she hugged me. I dubbed her ´Squid´. She has the heart of a warrior. In the face of adversity, Erin always finds the strength to pursue her goal”, stated Sensei Bob. Erin earned her black belt in October of 2012. “When I got my letter, confirming my place on the national team, I ran around my house, screaming. I am so lucky to have this opportunity to compete internationally, and be one of just sixty competitors representing Team USA”, she excitedly said. “When Hannah was young, she tried ballet, soccer, gymnastics, softball and piano - nothing interested her. One day she said she wanted to try karate. 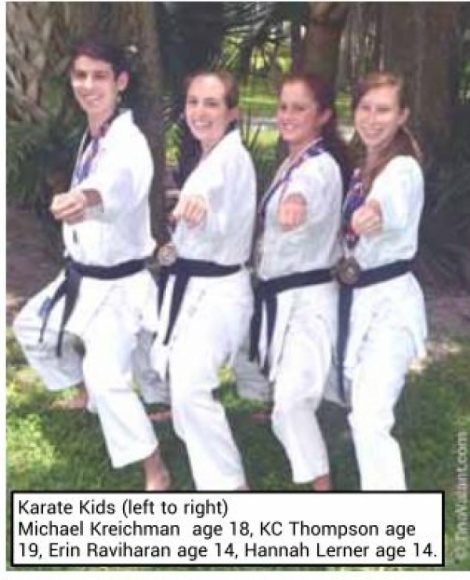 We found our home at Florida Karate Academy,” said Sherry Lerner, mother. Hannah Lerner is a West Boca High School freshman who earned her black belt in October of 2012. She has been practicing martial arts for half of her fourteen years. For her Bat Mitzvah, in April 2013, she had to develop her mitzvah project. By combining her love of martial arts and a desire to help others, she decided to introduce karate to special needs kids of all ages. What began as a project is now an on-going class Hannah continues to volunteerinstruct every Saturday. The Phoenix Group includes a blind person, and high functioning/learning disabled students. “I enjoy sharing martial arts with these students, they have taught me that patience and determination are the keys to success." “Everything for Hannah revolves around karate. She has made lifelong friends including her Team USA members”, added Mrs. Lerner. “This is a once in a lifetime opportunity, and will be my first time competing internationally. I look forward to the experience and excitement”, stated Hannah. Eighteen years old, and a recent Monarch High School graduate, Michael Kreichman began karate when he was just seven. “I divided my time between football and karate." He returned to Florida Karate Academy and earned his black belt three years ago. “Sometimes, after a student earns their black belt, they think they have achieved the final goal, and lose interest. However, in Mike’s case, his level of dedication excelled, above and beyond,” stated Sensei Bob. “Karate has taught me about setting high standards, and about being part of a team. Martial arts training affected my studies and football, in many positive ways. Not only am I honored to be asked to be on the team, but I get to share this opportunity with three of my close friends, KC, Erin, and Hannah”, Michael added. Each of these talented martial artists have qualified and earned a place on Team USA for the Fifth World Championships for Children, Cadets & Juniors. But first, they must each raise $4000, to cover travel and expenses to Szczecin, Poland, October 14-19, 2014. The World Union of Karate-Do Federation (WUKF) international competition serves as host to 2000 competitors (less than 60 from the United States) from 53 countries. Florida Karate Academy of Boca Raton opened in 1995, and survived damages caused by Hurricane Wilma. It is located on the northeast corner of Glades and 441, behind Steinmart and Best Buy. For more information, visit FKA Boca on Facebook, or call 561-859-8878. Donate by check: Florida Karate Academy, 9793 W Glades Road, Boca Raton, FL 33434.